Follow these two steps to achieve a clear complexion. Proper cleansing and exfoliation are essential for clearing acne and preventing breakouts. ClarityMD Acne Solutions Kit cleanses, exfoliates and treats blemishes to create a clear and healthy complexion. This set contains a cleanser and treatment product that target blackheads, whiteheads, clogged pores and excess oil. Both products contain exfoliating ingredients that remove debris and impurities from pores to help balance skin and regulate oil production. The exfoliating ingredients also create a smoother texture and a more even tone by encouraging cell turnover. These formulas are made with calming extracts that reduce irritation, redness and flaking. This set contains ClarityMD Deep Pore Cleanser (6 oz) and ClarityMD Clarifying Gel (1 oz). Cleanse and treat the complexion with this set to banish breakouts. 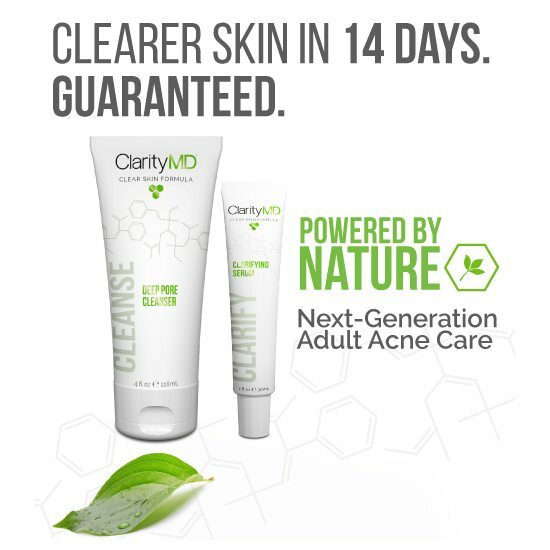 ClarityMD® is a next-generation clear skin formula that is designed to specifically target adult acne. Developed by Envy Medical Inc., (ENVY) an industry thought-leader with a simple, unifying philosophy of Designing the Science of Naked Skin. We develop brands that deliver a new wisdom in skin care, fusing simplicity of formulation and design with next-generation technologies to deliver transformational skin treatments for every one of our customers. Envy Medical Inc’s beginnings are firmly rooted in the dermatology and aesthetic skincare industries. Developed by and for medical professionals, our products are robustly clinically-proven and rigorously tested. Our founding mission is to offer highly effective noninvasive skin rejuvenation therapies for patients suffering from either dermatologic or aesthetic conditions. Envy’s first landmark invention, known as Dermalinfusion®, is used and relied upon by leading dermatologists and cosmetic surgeons worldwide under the SilkPeel® brand name. SilkPeel is a breakthrough system that combines precision non-invasive exfoliation using diamonds, with skin specific solutions for a deep delivery into the pores and surrounding tissue of the skin, for better outcomes in treating acne, hyperpigmentation, scars, fine lines and wrinkles. The Company also manufactures and markets professional grade anti-aging skincare products under the Lumixyl™ brand name. 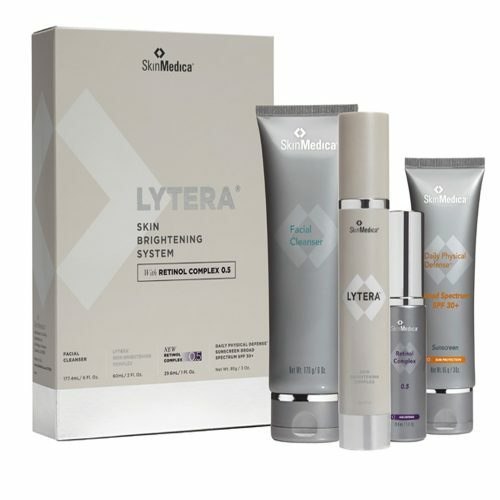 Based on skin brightening technologies Developed by a team of dermatological researchers out of Stanford University, Lumixyl contains the only peptide commercially available clinically shown to significantly brighten skin, and address hyper-pigmentation. These advancements in skincare have made Envy Medical one of the most recognized names in aesthetic dermatology across North America and in over 50 countries around the world. And yet, perhaps Envy’s most exciting new invention is the Bionutrient Clarity Technology incorporated into the new ClarityMD® clear skin system. Simple, powerful and effective, ClarityMD represents an exciting and disruptive development in the acne industry. Because it is so powerful and effective, and yet so affordable and easy to use, ClarityMD is a new generation of adult acne care that does it all with the aid of ingredients derived from or commonly found in nature. Get great results from one of the very best acne treatment solutions available. Our acne clearing complex uses the power of BAKUCHIOL to gently free your skin of acne while boosting healthy skin radiance, texture, and tone. This set contains ClarityMD Deep Pore Cleanser (6 oz) and ClarityMD Clarifying Gel (1 oz). ClarityMD Deep Pore Cleanser: Active Ingredients: Salicylic Acid 1%. Inactive ingredients: Water (Aqua), Decyl Glucoside, Cocamidopropyl Betaine, Glycerin, Xanthan Gum, Sodium Chloride, Phenoxyethanol, Caprylyl Glycol, Ethylhexylglycerin, Hexylene Glycol, Bisabolol, Hydrolyzed Psoralea Corylifolia Extract, Olea Europaea (Olive) Fruit Extract, Sodium Hydroxide, Aloe Barbadensis Leaf Juice, Dipotassium Glycyrrhizate, Sapindus Mukurossi Peel Extract, Dextrin, Perilla Ocymoides Leaf Extract. ClarityMD Clarifying Gel: Activeingredients: Salicylic Acid 1%. Inactive ingredients: Water (Aqua), Glycolic Acid, Sodium Hydroxide, Butylene Glycol, Polysorbate 20, Hydrolyzed Psoralea Corylifolia Extract, Olea Europaea (Olive) Fruit Extract, Perilla Ocymoides Leaf Extract, Lactic Acid, Bisabolol, Gluconolactone, Sodium PCA, Dextrin, Polydextrose, Amylopectin, Niacinamide, Hydroxyethylcellulose, Disodium EDTA, Sodium Benzoate. Morning Step 1 – ClarityMD Deep Pore Cleanser: Wet skin with warm water. Apply a nickel to quarter sized amount of cleanser and lather over entire face for 1-2 minutes, using our Konjac Clarity sponge or fingers. Gently rinse with warm water and pat skin dry with clean towel. 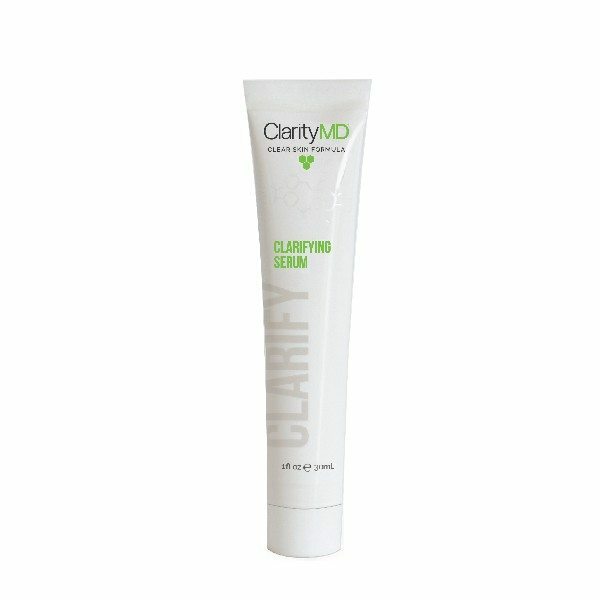 Step 2 – ClarityMD Clarifying Gel: Smooth a dime-sized amount of Serum as a thin layer all over face, concentrating on existing acne areas. Avoid eye area. Allow to absorb completely. Follow with your regular moisturizer and/or makeup routine. Evening Step 1 – ClarityMD Deep Pore Cleanser: Wet skin with warm water. Apply a nickel to quarter sized amount of cleanser and lather over entire face for 1-2 minutes, using our Konjac Clarity sponge or fingers. Gently rinse with warm water and pat skin dry with clean towel. Step 2 – ClarityMD Clarifying Gel: Smooth a dime-sized amount of Serum as a thin layer all over face, concentrating on existing acne areas. Avoid eye area. Allow to absorb completely. Follow with your regular moisturizer and/or makeup routine.